Reuben Foster's career with #49ers : 16 games, 101 tackles. It takes a certain kind of person to be a youth sports official, and these days, that kind of person is harder to find. Mike Abbatiello was one. He officiated his last game two years ago today. Please keep his family in your thoughts. Four people who need to pick up their play today if the Eagles have any hope of beating the Giants: 1) Nigel Bradham, 2) Lane Johnson, 3) Carson Wentz, 4) Fletcher Cox. Eagles defense has given up a TD pass on third down in each of its last four games. It has intercepted just one pass on third down. Last year, it had nine third-down interceptions. Eagles have given up a touchdown pass to a running back in each of the last two games. The double teams are taking their toll on him. But even on the rare occasion when he's been singled, I'm not seeing the same ferocity I saw earlier in the season. 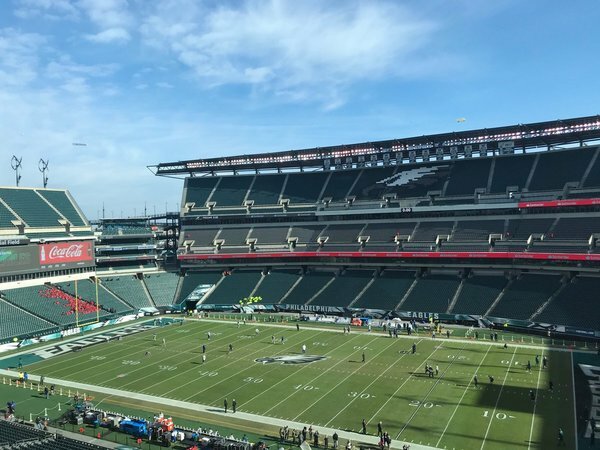 #Eagles inactives: J.Hicks, S.Jones, A.Maddox, J.Mills, M.Pryor, D.Sproles, N.Sudfeld. Rasul Douglas didn't practice this week. Curious to see how much he plays. But he'll be in uniform. Deiondre' Hall and Jordan Mailata are both active, too. #Eagles CB Rasul Douglas (knee, ankle) is active even though he didn’t practice all week. Could be an emergency bench player. Chandon Sullivan and De’Vante Bausby are likely starting outside CBs; Cre’Von LeBlanc likely in the slot. FWIW, Rasul Douglas active today. Sidney Jones, Jalen Mills and Avonte Maddox all down. They are cleaning the drool around Eli's locker as we speak. If Zach Ertz is targeted no more than three times again today, somebody's head needs to roll. Don’t go nuts but Jordan Mailata is active again. Still hasn’t actually gotten on the field. The Eagles' cornerbacks for this game are Rasul Douglas, Chandon Sullivan, De'Vante Bausby, and Cre'von LeBlanc. Only Douglas was on the active roster at the beginning of the season. Not sure he'll make play today, though. Without Jordan Hicks, the Eagles will likely use Nigel Bradham as the defensive play-caller and will turn to Nate Gerry as the middle linebacker in the base defense. Eagles like Gerry -- Schwartz has gained trust on him. Without Avonte Maddox, look for Corey Graham and Tre Sullivan to split work at safety. Deiondre' Hall is in uniform, too. Hall has a CB background, so could be used in an emergency there, too. Without Jordan Hicks, the Eagles will likely use Nigel Bradham as the defensive play-caller and will turn to Nate Gerry as the middle linebacker in the base defense. Eagles like Gerry -- Schwartz has gained trust in him. Despite the issues in the back end, the Eagles build their team around the lines and should have (/need to have) the advantage of the lines of scrimmage. If Eagles win, it will be because of Wentz, blocking, and pass rush. Lane Johnson said he was able to really practice this week for the first time since the Vikings game. He's been banged up for weeks. They have Warmack, Big V and Mailata active. That oughta be enough. We don't really get to watch practice. True! Sorry. Yeah they have plenty of active OL. Maybe Wiz can play corner. Yes but not so many in the defensive secondary -- down five corners and a safety. That's a lot.